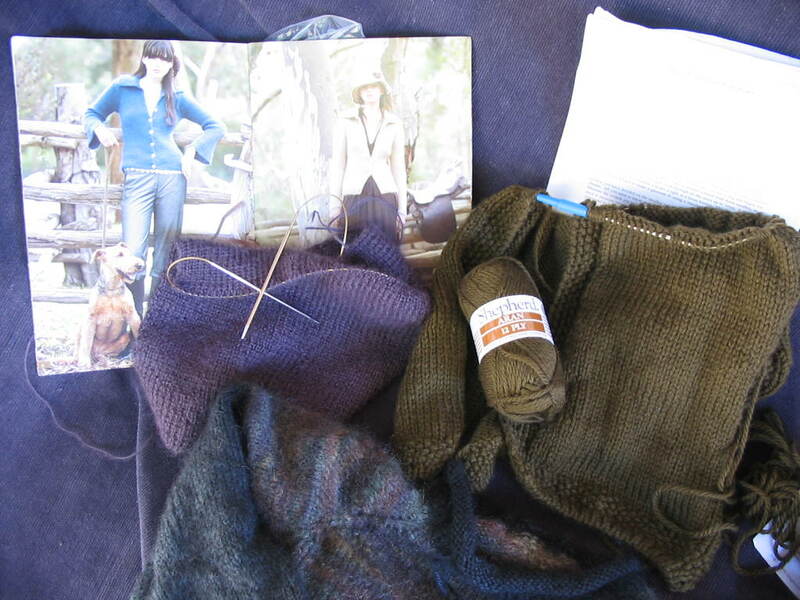 In the absence of one of those zippy little side bars with graphic representations of various projects, I'm going to document my current knitting with photos. This is in the vain hope that in a few months time I will look back and congratulate myself for completing every single one of them. Note I said 'current' projects - I'm not going near the diehard UFO's - not yet anyway. 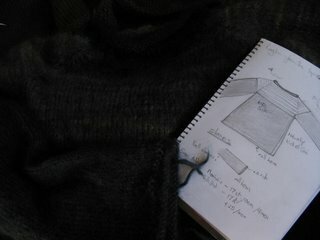 Item 1: The Eki Riva Cardigan. I love this alpaca/silk blend - the softness, the slub, the gorgeous colour. I picked up the wool last year at the Prestige Yarns stand at Darling Harbour and have combined it with a "Naturally" boucle in mossy tones. The pattern is a basic Cleckheaton cardi. The only thing that needs to be done is the sewing - I tried to save a bit of time by doing the back and front all in one, so the sleeves are all I have to do - as well as finish off the neckband. But, as they say, "the devil is in the detail" - I am not going to rush these last few tasks as I really want to wear this silky, soft, garment. Item 2: The red ball of wool also in the picture is some lace weight yarn from Rubi & Lana's that will be turned into a pair of Fingerless Mittens from Magknits. I have adapted the straight pattern to circular and have begun juggling my purple, 3mm, DPN. That will make sure no one sits next to me in the train! Speaking of DPN, the loss of one bamboo DPN in that said train has bought Item 3: the "Naturally" Silk/Mohair, top-down jumper, to a screaming halt. 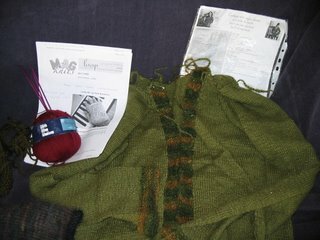 I have only one sleeve to go - no seams! The annoying thing is I still have 4 needles left as Clover sells them 5 to a pack. So it's obviously a severe form of procrastination. This was a learning experience that has turned out to be mildly successful but I would actually like to wear it one day. The image is a bit dark I know - it's black/bluebottle yarn on a Navy blanket. No prizes for photo composition here. Cleckheaton Studio Mohair Cardi in K1P1 rib and the Guild "No Pattern" Cardigan in Shepherd Aran 12ply . The first I will stick to the pattern, the second I make up as I go along (with a little bit of preplanning). I love knitting the Shepherd - after fiddly laceweight and sticky Mohair the Aran just flows. So - 5 items. Will they find completion? Will they overcome distractions, temptations, computer games, work, and other excuses to take their rightful place in the wardrobe? We shall see.